Situated in the private gated neighborhood of Bradford Park in Fort Worth’s exclusive Rivercrest area is this five-bedroom home with classic charm. Bradford Park consists of only 7 custom homes designed around a beautiful central park. Designed by award-winning local architect, Weldon Turner, the Italian villa inspired home is awash with light. Walls of steel windows in every room offer stunning views of landscaped courtyards and an elegant pool and spa. AD Top 100 Designer, Emily Summers, oversaw the full renovation with the current owners in 2009. The interiors are the perfect balance of sophistication and warmth. An entertainer’s dream home with French doors off the main gallery, living room and master suite that make the home perfect for indoor/outdoor living. During the renovation, Summers incorporated marble baths, Holly Hunt fixtures, Murano glass lighting, Venetian plaster walls, and built-ins throughout. The master suite is downstairs and is tucked in between a beautiful courtyard with a vertical garden and another courtyard that overlooks the pool. A well-appointed living area with fireplace overlooks the rear courtyard. The current owners also added a custom cut limestone outdoor kitchen and grill area complete with a Renato pizza oven to make for the perfect entertaining space. French doors open to the pool and courtyard for peaceful morning and evening visits. Downstairs features a large living room, paneled library/study, formal dining room, and family room. The gracious living room is complete with fireplace, 14′ ceilings, floor-to-ceiling Hope steel windows and doors that open onto the covered patio and pool. The dining room is highlighted with high ceilings and stunning ombre hand dipped Italian linen draperies. 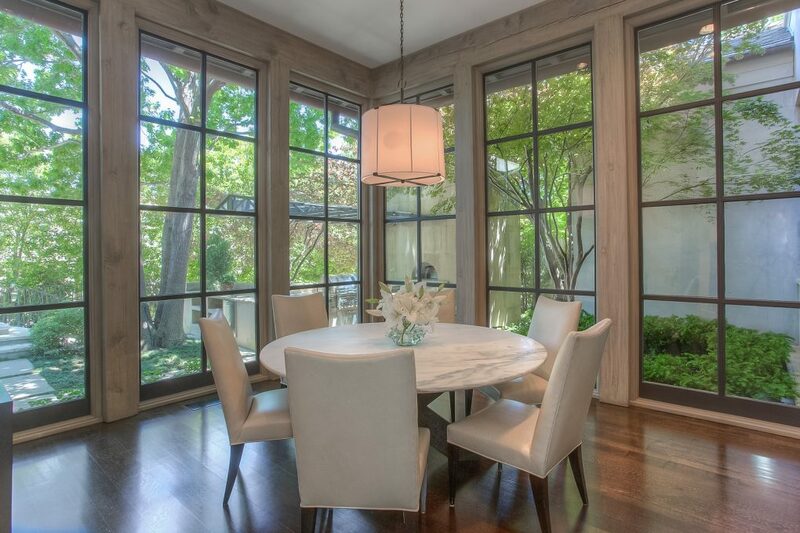 The kitchen is a chef’s dream, with a sitting area with fireplace in the kitchen and adjacent to the breakfast room. The adjoining breakfast room appears to ‘float’ in a garden aside the outdoor grill and pizza oven. Upstairs are 4 bedrooms each with ensuite marble and stone baths, all beautifully appointed with the finest fixtures and lighting and finished with the highest quality carpeting and draperies. Julie Hayes of Simms Hayes Designs made her mark on the home in 2011 by transforming the basement area into an arcade and game room. 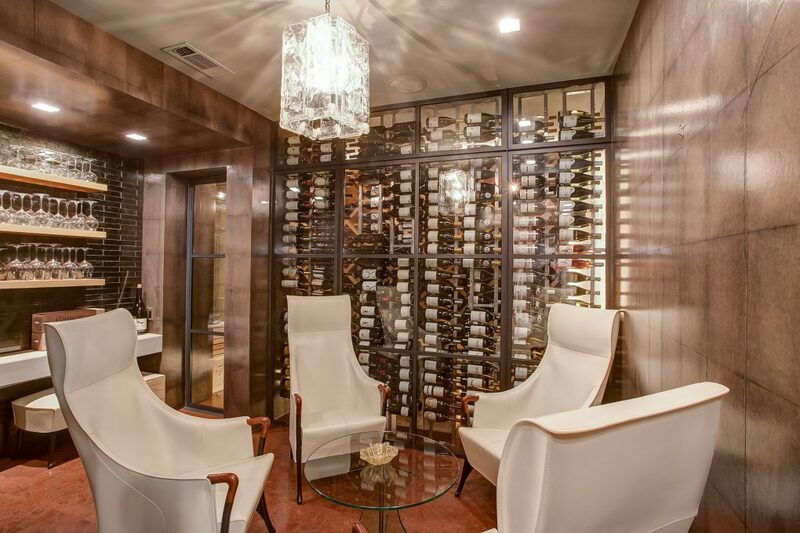 A room within the basement originally designed as a ‘safe room’ and lined with Kevlar now serves as a sparkling jewel box wine room with beautiful rack system and Venetian glass lighting. This home is listed for $5.75 million with William Trews and is showcased by Luxury Portfolio.